Who's most likely to report a UFO sighting? Albert Einstein, Marilyn Monroe, Superman, Abraham Lincoln or Mrs. Kenmore - your third grade teacher? Who would dress up to visit a nudist camp? Cheat on an exam? Be recruited by the CIA? From celebrities and politicians to fictional characters and even your now famous ex... no one is spared in the game where the majority always rules! After nominating five candidates, players draw question cards that place the characters in awkward, ludicrous or extreme situations, then vote for the one they believe the situation applies to most. The majority wins, but you'll enjoy watching your friends defend their selected candidates, no matter how absurd their claims might be. 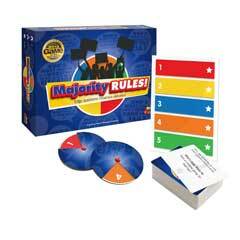 In this off-the-wall game for 3 to 8 players, you'll argue passionately, laugh out loud and wonder why all debates can't be this much fun! Majority Rules is a game of gathering votes for various factions: Governor, Congressman, Senator, and President; and collecting the money that's associated with them. Rewards of bonus states are available, but beware of the penalties, which include being exiled to D.C.
Laughter and memorable fun guaranteed! Quick to set up and easy to play!